The headline of your social media message can have a profound effect on both the tone and way people respond. Two personal examples follow. In each case I had quite a number of responses - but with totally different outcomes. I have to start with an apology to Cambridge Cyclists. My obviously eye-catching blog title “80 percent of Cambridge cyclists are illiterate! A cultural survey”, in true Red Top Newspaper style, immediately got a response – primarily through Twitter. Cyclists were deeply offended! I thought I’d written a light article on the different ways people would respond to the sign “Cyclists Dismount” in the UK and Germany. Message: In the UK you basically ignore it; In Germany you would probably ignore it – unless there were other people around. What I’d actually done was land in an existing pool of simmering rage within the cycling community about meaningless advisory signs, such as the “Cyclists Dismount” one. Most responses were educational, generally negative and verbally robust – along the lines of “insult me – and I’ll give as good as I get!” Some respondents managed to reply simply or even with some humour and they have my special thanks. The post with 93 hits had 4 comments and at least 21 twitter responses within 24h. Of these, 2 did state that they would choose to dismount if there were pedestrians. Do have a good look at the responses in the appendix below. They are in the public domain – just summarised here. LinkedIn items have a longer response time and are still coming in after 12 days of the original post. So far, this has resulted in 16 responses (including my own). All are positive and informative. In fact, if you want to visit a German Christmas Market, whether in the UK or Germany, there are some great personal recommendations there. Again, as the items are in the public domain, they are summarised below for your convenience. The question you have to ask yourself when putting material out on social media is – what sort of response do you want? A Shock-Jock headline is likely to get a lot of robust responses. Great if you are trying to boost radio show responses. Bad if you are trying to make a positive connection. Humour is a double edged sword. Not everyone may share yours and you could equally well land face down in the mud. Appealing to people’s better nature will generate a positive response, but only if it is relevant or of interest to them. So what am I going to do? Definitely tread more carefully! @miltoncontact You, sir, are an idiot for a) calling cyclists illiterate and b) launching such an attack on incorrect information. @cotnm @AsEasyAsRiding @gnomeicide @miltoncontact Wow. How did we get engineers this stupid? I thought Gove said we are a clever lot? @gnomeicide @miltoncontact Blue signs are advisory, you don't have to dismount. Clearly you are not an academic, best keep away from stats. @miltoncontact Erm, the "rule" in question is indeed optional. Blue signs are advisory only. @gnomeicide Entirely advisory. I would dismount or wait if there was a ped, but would continue if it was clear. @miltoncontact is ignorant. @miltoncontact and, frankly, to call others illiterate from a demonstrable position of ignorance is offensive. Retract please. My favourite Christmas market is in my hometown, Bad Wimpfen. The medieval surroundings add extra charm and atmosphere. Birmingham is a great success; crowded, vibrant and all the trimmings. German Christmas markets - just those three words create a thousand pictures, hundreds of aromas and decades of memories - from child to adulthood for those lucky enough to have that experience; mine was limited to just a dozen or so years. Any Christmas Market, Paderborn, Hannover, Koln, Celle ...... the list goes on. I think I would like to visit a different town or city each year! Germany is defiantly the best place to be in December which ever market you manage to visit!! 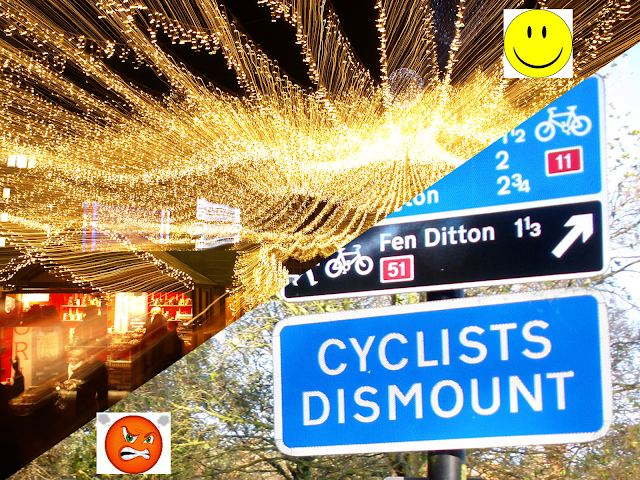 Now of course we have an additional factor, do you prefer the modern German Christmas markets, or the ones adhering to the older mediaeval form! Essen had both last year. Köln had a medieval market, but it hasn't been there for the past two years. My personal favourites are Köln's markets at the Dom and Alter Markt. My son is going there on a school trip next month - I wish I was going too. Does anyone know of any good ones in Dusseldorf or near to Dusseldorf? There is bound to be some within the Düsseldorf altstadt area, a great place that i frequented a lot when I lived in Düsseldorf for over even years. I would say Koln was pretty close, but Dusseldorf will have it's own. Personally I like Koln, adore Monschau a little village between Koln and Aachen but for a really interesting experience the Valkenburg Caves in Limburg in the Netherlands just over the border takes some beating...especially when you reflect on its historical background during WW2 and that it could accommodate seemingly 35,000 people in the event of a nuclear attack during the Cold War! Koln is without doubt the best in Germany we have visited along with the pretty little village of Monschau, but you should try the Valkenburg Caves in Limburg just over the border in The Netherlands...natural caves where soldiers took cover during more troubled times and also where seemingly there was accomodations for 35,000 people in the event of a Nuclear Attack during the Cold War...quite a venue for a Christmas Market I can assure you....plus the prices are cheaper! Manchester's Christmas German Market is huge, thousands of people from all over the North West of England are drawn to it, its so big they have added a French section and a Spanish section too. It is also a great opportunity for lots of small artisan supplies from all over the UK to take advantage of the Christmas trade in the UK's second biggest city. There is an excellent market in Kempen (near Krefeld) which specialises in 'home-made' goods. The town itself is also very interesting. Check first though for dates/times. If you do go to the Köln market go by public transport (the parking is horrific). Of the Berlin markets the one around the Gendarmenmarkt is the most spectacular. But do get out to Spandau for a contrasting experience.